The Skarp Laser Razor was supposed to take care of hairy situations. Instead, it created one. The device, which bills itself as the world’s first-ever razor powered by a laser, had raised more than $4 million since launching on Kickstarter last month. On Monday, that run came to a grinding halt: Kickstarter suspended the campaign, claiming the company broke the rules by offering a physical product as a reward without having a working prototype. More than 20,000 people had backed the project. Soon after its suspension, Irvine, Calif.-based Skarp launched its campaign on rival crowdfunding platform Indiegogo, where prototypes are not required. As of Tuesday evening, the campaign had attracted $165,000 from about 1,100 people. After pressure from special interests lobbying Kickstarter regarding the stage of our working prototype, Kickstarter applied a rule in a way it is not applied to others. 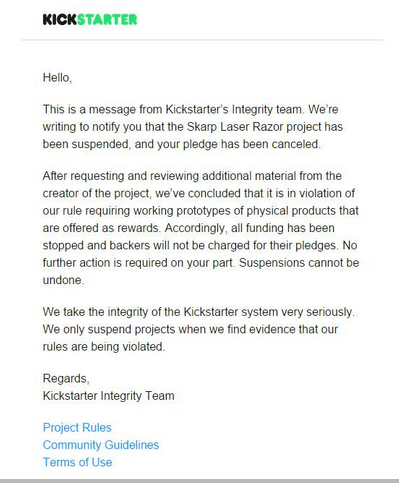 A rule which if applied, would warrant the removal of the majority of the campaigns on Kickstarter. This decision left tens of thousands of people disappointed. There was little communication with Kickstarter. After being approved initially, they requested another demo, which they said “Looked great” after we posted it. However we were suspended without any warning & have now been locked out without the chance to communicate with our tens of thousands of supporters. Indiegogo has been incredibly supportive & communicative. It's clear they are interested in bringing exciting, cutting edge campaigns to their platform. They believe in the Skarp Razor as much as we do!